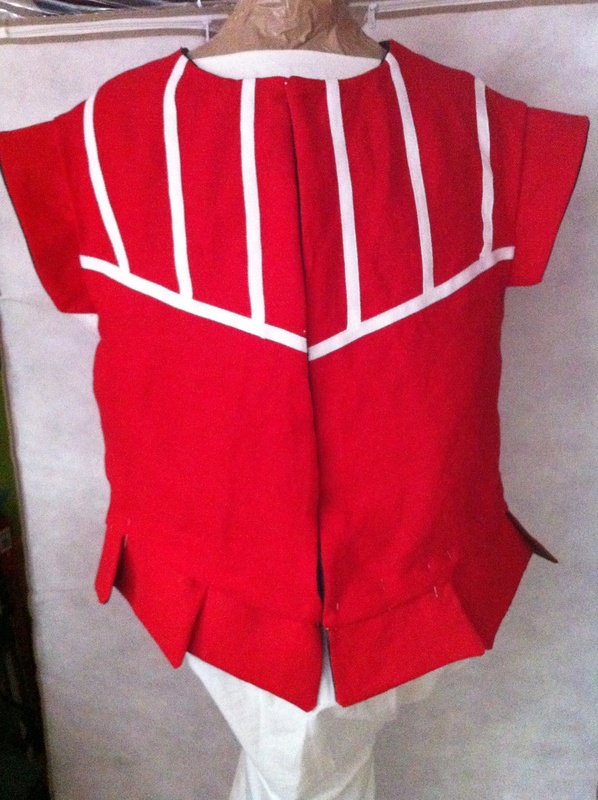 The doublet for my son turned out VERY well, and I’m extremely pleased with it. 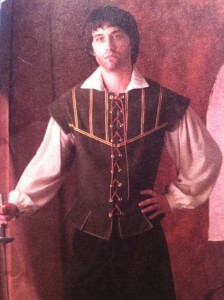 The Simplicity pattern was just as good as the one I used for my Tudor gown — easy to understand directions, simple construction techniques, and a great looking (and well-put-together) garment when completed. I was able to use the tablet-woven band Alexander worked on on the front, and supplemented it with red grosgrain ribbon. I was also able to make it reversible, so Alexander can wear the red linen side out if he prefers. And, I while it is loose on him (he’ll be able to wear this for several years), I think it still looks pretty good. 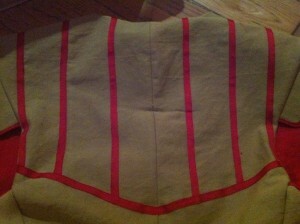 I did end up shortening the bottom by about 3-4″, however, as it was just much too long on him. 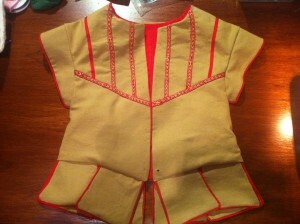 I also put in a special “kid-friendly” feature — a hidden pocket behind the front right peplum! In addition to loving pirates and gold, Alexander loves pockets. I’m going to hide a gold doubloon in there and see how long it takes him to find it. 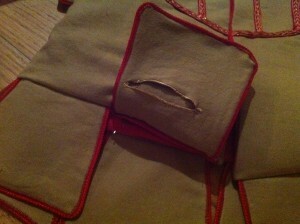 I still need to finish the eyelets — I’m working on those now. I’ll take a photo of Alexander wearing his entire “pirate” outfit as soon as I get a chance. I’ll also try to take some better photos when it’s not so dark. Tomorrow will be a busy day with non-SCA stuff, so I may not get to my Garb-A-Day goal, but I guess that just means I’ll have to double up on another day. 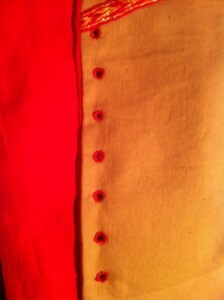 Here’s the progress on the eyelets — they take a long time! 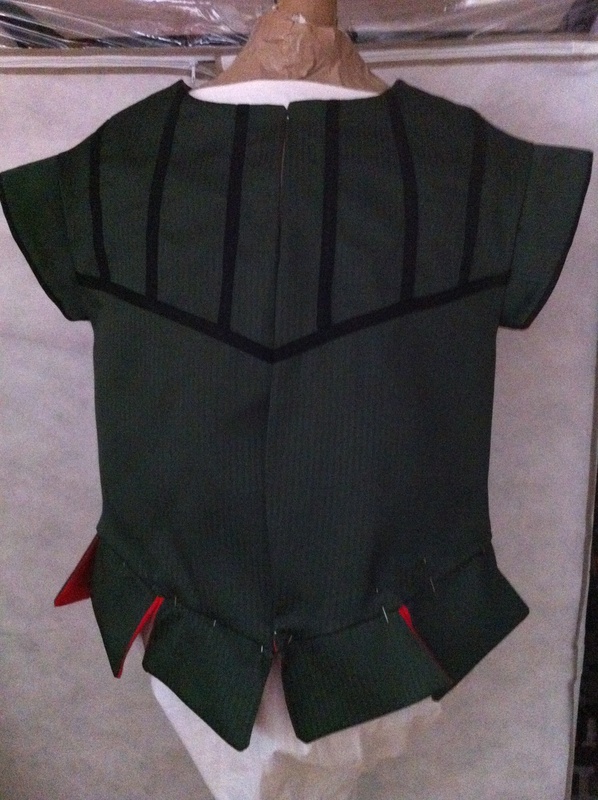 Alexander’s doublet will be made of a gold 100% cotton canvas twill with red linen as a lining, and Gregor’s is a green striped cotton canvas (same fabric as my Tudor gown) with green broadcloth as the lining. I’ve already cut out all the pattern pieces for both. 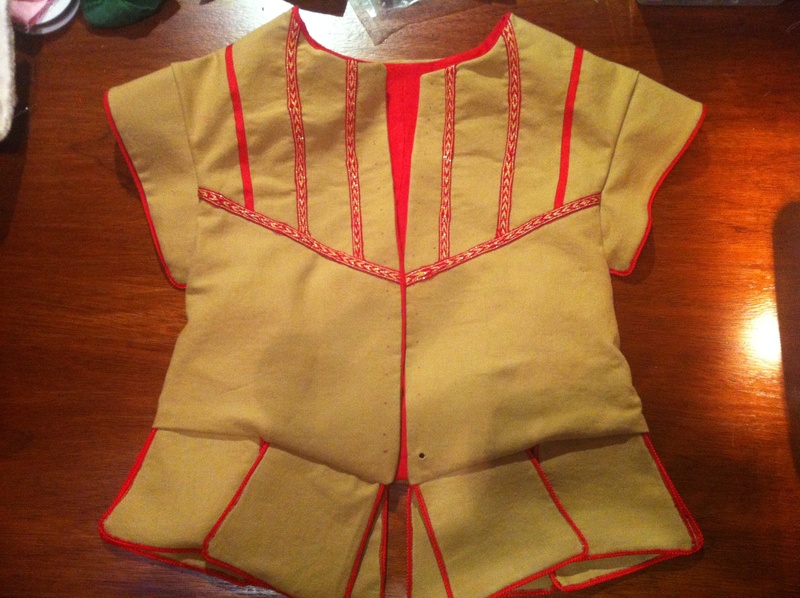 So tomorrow I’ll begin sewing Alexander’s doublet — with any luck, I can finish it within the day. I should also note that I’m actually making both doublets from the same set of patterns — size XS for Alexander and XL for Gregor. Alexander’s will likely be a little loose and a little long, but hey, he can grow into it, right? If it’s too big, maybe I’ll just make him a belt, or add a tie to the side that we can use to tighten the back. 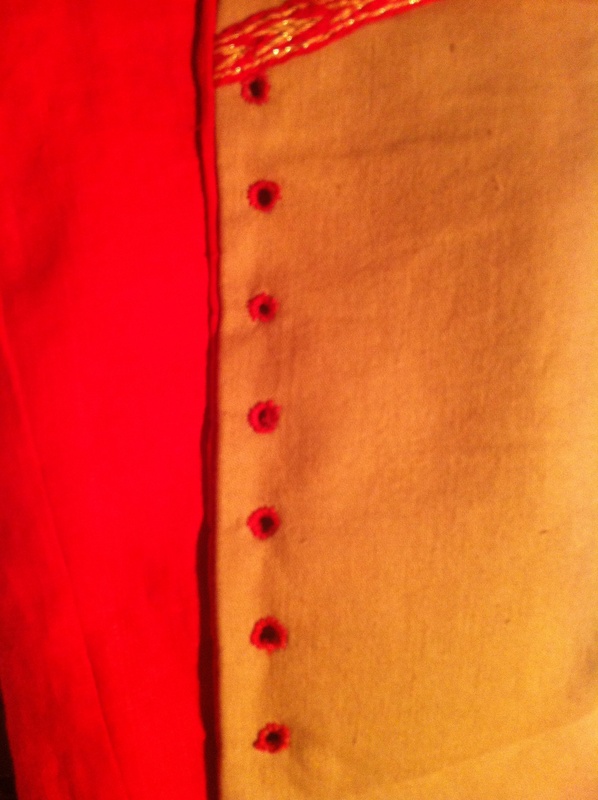 Oh, and I plan to hand-sew the eyelets (rather than use grommets) to give the doublet a more historically-accurate look. For the trim on Alexander’s doublet, I want to use the Golden Path of Fire tablet-woven band that Alexander came up with and has been working on. 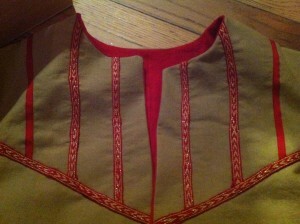 Not sure what trim to use on Gregor’s doublet, however — maybe a silver cord?